A pepper steak (steak au poivre) is a French bistro classic that you can easily replicate at home. A good pepper steak can be prepared with all kinds of peppercorns — we typically have black peppercorns handy so that’s an easy way to spice up a steak dinner but if you want to fancy it up, you can use white peppercorns, green peppercorns for an old fashion sauce au poivre vert (green peppercorn sauce) or a mix of peppercorns (black, white, green, and pink) — you are the Chef in your kitchen so you get to pick! But regardless of the color of your peppercorns, the common theme for all is not too much pepper, otherwise you won’t taste the steak or the delicious creamy Cognac sauce of this pepper steak recipe. 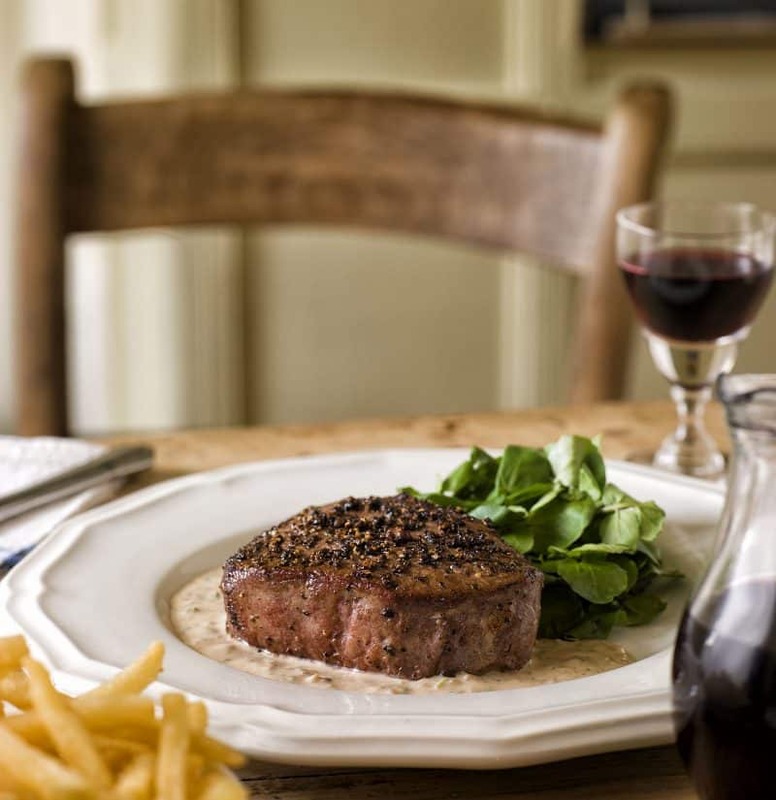 With its rustic feel, a pepper steak is the kind of comfort food that cheers you up, so why not treat yourself and the family to this French bistro classic? And if you serve it with French fries, make sure to dunk them in the sauce — si bon! So if you are looking for an easy entree for this coming week end that is sure to please everybody in the family, check below for the Art of the Home French bistro pepper steak recipe and Art of the Home suggestions, including side dish suggestions that marry well with this tasty steak and a children’s version of steak au poivre. Enjoy and bon appétit! Remove steaks from the fridge at least 30 minutes before cooking. Note: very important step. Pad steaks dry and sprinkle a good pinch of fleur de sel on each side. In a dinner plate, grind your peppercorns using the coarser setting of your pepper mill or even better in a mortar. Then press gently each side of the steaks to coat them with pepper – by pressing on the steaks, the crushed peppercorns (poivre concassé) will stick to the steaks. Heat up the oil and butter in a skillet and sear the steaks under high heat on both sides. By adding vegetable oil which has a higher smoke point than butter you will be able to bring to butter the higher heat which is necessary to sear your steak au poivre. How much you cook the steak will depend on how you like your steaks done. For rare, a couple minutes on each side will be enough and for medium rare go to about 4-5 minutes. Deglaze under high heat with the Cognac by scrapping all the caramelized bits of steak and peppercorns. Remove from heat and carefully ignite the cognac to burn off the alcohol. Tilt and shake the pan gently until there are no more flames. Note: this is a traditional recipe that calls for flaming the Cognac but you can certainly feel free to skip that step if you prefer. In this case, the sauce may be a bit more bitter since the alcohol was not burnt off and Cognac does have a strong taste but we’ve done it in the past and it is still very good. Under high heat, bring the sauce to a boil and reduce until it thickens. When you get a nice light brown color, remove from heat and cover your steak with this creamy pepper sauce or place your steak on a bed of this beautiful creamy cognac peppery sauce. Enjoy! Side dishes: des frites, bien sûr (French fries, of course!). We suggest the healthier Art of the home homemade French fries but without the herbes de Provence so the star of the show remains the peppercons. And for greens, we recommend a delicious and delicate salade de mâche (lamb’s lettuce). Menu Enfants (Children’s Menu): children love burgers so why not a small French twist on their favorite. Skip the bun and serve them a steak hachée au poivre (pepper burger). You can go light on the peppercorns for them and even skip the cognac and use beef stock instead but of course no skipping the French fries! And this Menu Enfants (Children’s Menu) is for children of all ages so feel free to serve this for everybody in the family, enjoy! Background Music: and if you like to eat with music (en musique), may we suggest that for background, you turn on the Art of the Home Music Channel.